November 18, 1936: USS Indianapolis CA-35 departing Charleston, South Carolina for a Good Neighbor cruise to South America. 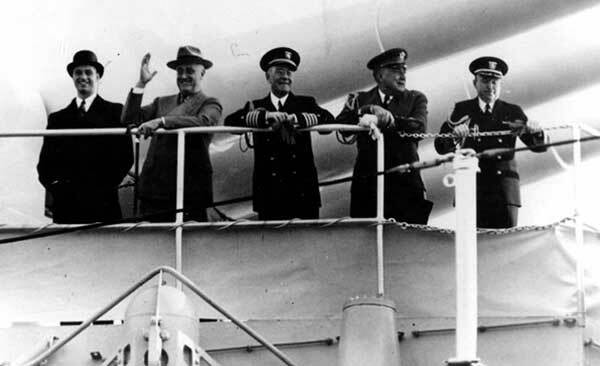 From left to right are: James Roosevelt, President Franklin D. Roosevelt, Captain Paul H. Bastedo USN, Colonel Edwin M. Watson U.S. Army and Captain Ross T. McIntire USN (MC). How many United States presidents would you guess have visited our fair city while in office? Two, ten, twenty? Well, the number’s probably not as high as you might think, since many former presidents missed the mark for one reason or another. For instance, Ronald Reagan and current president Barack Obama campaigned here, but didn’t return after elected to office. Vice President Gerald Ford came to Charleston in 1974 to accept an honorary degree from the Citadel--a mere six months before being sworn in as the 38th president. LBJ did not join his wife on her 1964 Whistle Stop Tour of the South to promote Civil Rights--he let her take the heat and hecklers in Charleston on her own. Grover Cleveland passed through here by train in 1888 with his new bride; on their way to Florida, they stopped briefly in Savannah instead of Charleston, so that doesn’t count. Oh well, their loss, right? The most interesting pre-presidency stay in Charleston was made in 1942 by none other than John F. Kennedy. Kennedy, 24, was a new ensign in the Navy when his sister Kick introduced him to a coworker at the Washington Times-Herald, Inga Arvad. The former Belgian beauty queen was one of the few who had been granted an interview with Hitler and was his guest at the 1936 Summer Olympics in Berlin. The married 28 year old had already been flagged a potential spy by the FBI when she started a romantic relationship with Kennedy in November 1941. Once J. Edgar Hoover realized who Inga was dating, he wanted the British ambassador's son ousted from the Navy as a potential security threat. Instead, Kennedy was transferred to Charleston and assigned a desk job in January 1942. The couple kept close correspondence (she referred to him as “young Kennedy” and he addressed her as “Inga Binga”) and Inga visited Kennedy in Charleston three times--twice they stayed at the Fort Sumter Hotel (now the Fort Sumter House at 1 King Street) and once at the Francis Marion Hotel at King and Calhoun. Their hotel rooms were wired and the couple was followed while she was here in Charleston. Soon, he was shipped off to the Pacific and as time passed their romance fizzled. Although there was no evidence supporting the notion that she was a spy, Hoover never really let it go. And after Jack made up his mind to run for a congressional seat, Inga wisely did let him go. The titillation level of his story notwithstanding, JFK was not president when he visited Charleston so he can’t be included in our count. Therefore, the United States presidents who were actually presidents when they visited Charleston number only seven. George W. Bush made it to Charleston twice during his presidency--to address the Citadel in 2001--a mere 3 months after the 9/11 terrorist attacks--and again to rally support for the ongoing war in Iraq in 2006. 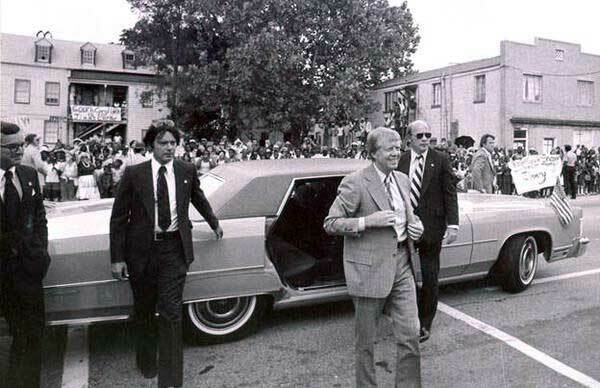 Jimmy Carter addressed the Southern Legislative Conference at the Gaillard Auditorium in 1977 and Dwight D. Eisenhower accepted an honorary degree from General Mark Clark at the Citadel in 1955. Franklin D. Roosevelt absolutely loved Charleston and made frequent visits during his presidency in the 1930s, addressing the Citadel in 1935 and often visiting the Navy Base. William Howard Taft and his wife were frequent guests of Mayor R. Goodwyn Rhett at his home, the John Rutledge House at 116 Broad Street (now an inn), several times between 1908 and 1912. As legend has it, Rhett’s butler (!) was asked to “dress up” the pale crab soup they usually served. The butler, William Deas, added lump crab meat and the orange-colored crab eggs to give color and improve the flavor, thus inventing the Charleston delicacy know as She Crab Soup. Some contend that Taft enjoyed it so much he had the soup added to the White House’s menu. Mayor Rhett was also the president of the People’s National Bank and organized the erection of Charleston’s first skyscraper at the corner of Broad and State, now known as the People’s Building. 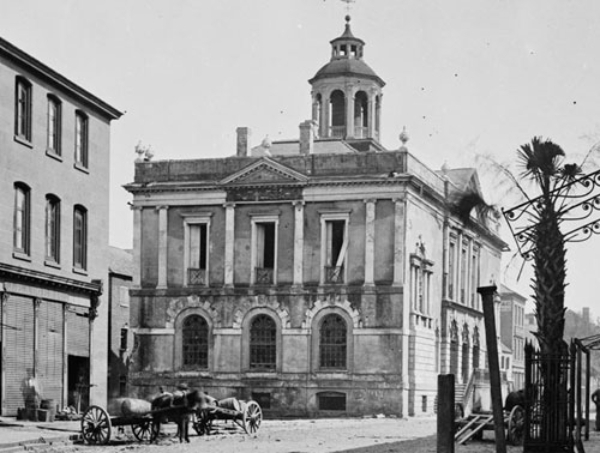 At the time, some believed the building represented progress in Charleston, but others believed it would ruin the city’s skyline. President Taft, who rode the steel frame elevators to view the city from the top of the building said “I don’t believe that it did ruin the skyline, but if it did the view from up here makes it worth it.” Looks like he’s right. 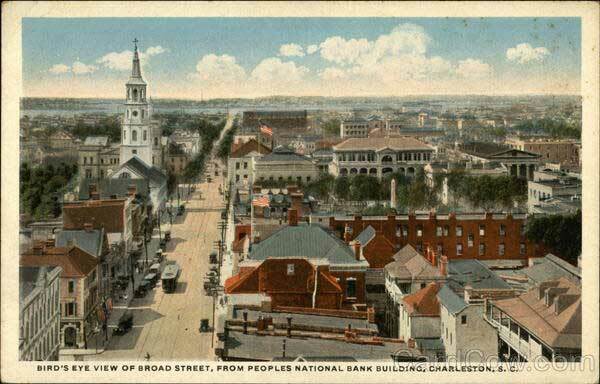 In December of 1901, Charleston opened the South Carolina Interstate and West Indian Exposition to promote the industry and resources of the state. President Theodore Roosevelt accepted proprietor FW Wagener’s invitation to attend the Expo’s “President's Day” celebration in April, 1902. The president viewed Charleston’s historic sites from the harbor aboard the USS Algonquin and then was lead to the Exposition by a huge parade with thousands of onlookers. The president visited the exhibits, addressed distinguished guests, and was invited to the Women’s Building at Lowndes Grove where he was treated to a special Charleston lunch. After his day in Charleston, the President was escorted to Summerville where he stayed at another one of FW Wagener’s enterprises, the Pine Forest Inn. The Inn opened in 1891 as a spa for the physically ill and those requiring rest and relaxation. It’s main parlor had over 100 rocking chairs and was called the Rocking Chair Room. It boasted its own power plant, telegraph office, long distance telephone service and steam heat. To entertain oneself while visiting the resort, a guest had the choice of three bowling alleys, shuffleboard, billiards, pool tables, 130 golf links, a stable of 50 horses or listening to the in-house orchestra. 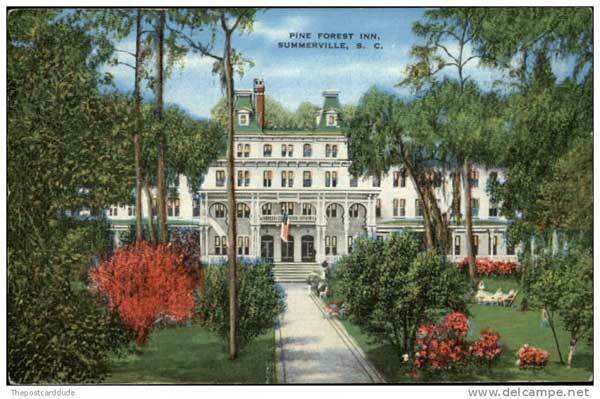 The Pine Forest Inn was an international destination until the first World War, when the spas in the area declined and shortly after, closed. What a shame! The first president to visit our fair city was the first president of our country, George Washington. In keeping with his inaugural promise, Washington embarked on a lengthy Southern Tour to learn more about this region’s political sentiments and economy. Washington arrived in Charleston in 1791 to great fanfare. His barge, which departed from Mount Pleasant, was manned by 12 local ships captains and accompanied by boats of all sizes containing revelers and bands that played music as the President crossed the harbor to arrive at the foot of Queen Street. In an effort to avoid insulting anyone who offered to put him up during his stay, Washington rented the Church Street home of Thomas Heyward (signer of the Declaration of Independence) while Heyward stayed at his plantation. Early morning risers were treated to the sight of the President racing his horse up and down Broad St. for exercise. During his weeklong stay, President Washington was wined and dined in traditional Charleston fashion. One of the many parties that the president attended was a formal ball that was held in the Old Exchange building. This was such a monumental occasion that the ladies of Charleston wore pictures of George Washington with the wording ‘Long Live the President” in their hair. The President wrote in his journal, “Went to a concert where were 400 ladies, the number and appearance of which exceeded anything I had ever seen.” Some things never change, right? In the same area that Washington appreciated Charleston’s finest, our own Ruthie Smythe has been quite the busy bee of late! Ruthie recently assisted the sellers at 14 Elliott Street and the buyers at 1 Vendue Range. 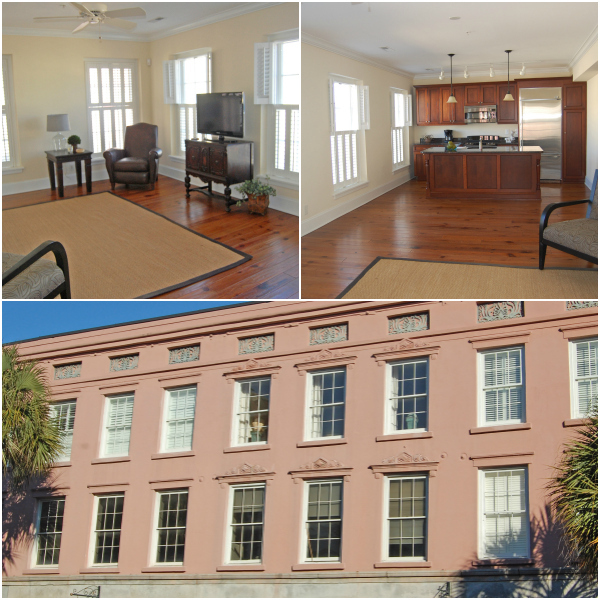 She also has listed for sale the residence at 160 East Bay Street; click for full listing information or call Ruthie at 843-729-1290 to schedule a showing. If you're in the market for something else, check out all of Lois Lane Properties current listings and rentals along with all homes for sale in the downtown Charleston area. Above: For sale: 160 East Bay Street. 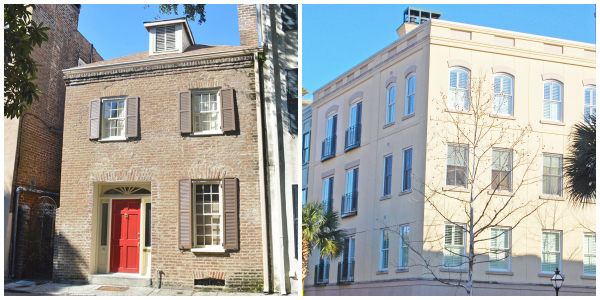 Below: Sold: 14 Elliott Street (left) and 1 Vendue Range (right).